This is one of those times, I don’t mind admitting how wrong I was. Two days after publishing this post, I ran into an issue that I realized Gravity Forms would make 10x easier. I had been searching for months for a method to make user generated content easy, without requiring users to log into WordPress. Just a few tweets to @carlhancock (one of the partners at Rocket Genius, the creators of Gravity Forms), and presto! Gravity Forms allowed automatic publishing of user submitted posts in their next update. Now I’ve spent quite a bit of time online, and I can tell you it is RARE to find interaction & service like that on a product. I upgraded to a developer license the same day & couldn’t be happier. 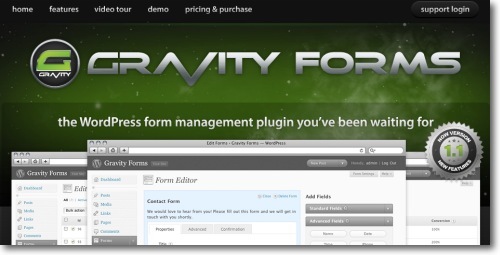 Gravity Forms has joined an elite group of plugins that I install on every single WordPress site as part of the initial set up. On one site alone I’d estimate I’ve saved 15 hours so far. For me, that’s well worth the $199 price of a developer’s license. But, if you have only one site, or aren’t quite sure that you’ll love Gravity Forms as much as I do, give it a shot with the single use license. It’s only $39 and you can always upgrade later. I’ll leave my original review for you to read below. I just felt like I’d be doing you guys a disservice if I didn’t update this post to completely rave about such a solid plugin. When a plugin has hundreds if not thousands of competitors, you instantly know two things: there’s a HUGE demand for the functionality it provides, and it’s going to be tough to rise above the crowd. Such is the case with Gravity Forms, the newest premium plugin to tackle the form issue. If you do a quick search for “form” in the plugin directory you’ll see over 800 results shown. If you narrow that down to “contact form” you’re still left with well over 150 different options. However, if you keep tabs on the WordPress community, you’ll know that Gravity Forms hasn’t had much trouble getting noticed, despite the crowded plugin landscape. How’d they manage to pull that off? Amazing functionality. Now that’s something that’s a lot easier promised than delivered but even with my sky high expectations from the hype that’s been surrounding the plugin, I wasn’t disappointed. Gravity Forms (yes, that’s an affiliate link for all of our FTC friends out there) basically allows you to create a whole host of different forms with just a few clicks of the mouse with no coding required. The interface (as seen below) is extremely intuitive and I had no trouble finding my way around. If you want to add an element to your form, simply click which field you want to add & drag it where you want it positioned. In about 10 minutes time I was able to reproduce the contact form that I had been using via Contact 7 plugin as well as create a brand new Guest Post Submission page. Not only does the form allow any fan of WordPress to submit a guest post for my consideration (including post images), it automatically turns that submission into a draft within my WordPress dashboard! The Thesis theme disrupted the market by offering incredible flexibility from your theme. Gravity Forms has done the exact same thing. The incredible functionality makes blogging life easier and the unprecedented flexibility eliminates the need for any other form plugin. The features I’ve highlighted really are just the tip of the iceberg but thankfully you can check out all the different features, take a video tour, and even play around with a demo installation over on the Gravity Forms site. As I’ve already discussed, I love the functionality offered by Gravity Forms. But the one aspect of the plugin that I pretty much hate, is the pricing structure. A single use license is $39, a 5 site license will run you $99, and an unlimited use license will cost you a wopping $199. I mean, it’s a plugin for crying out loud! If you’re a web designer or make your living with your websites, $199 might be well worth the time you’ll save using the plugin but I bet your jaw still drops a bit from sticker shock. Now will I end up breaking down and forking over the money at some point down the line? But, when a plugin is more expensive than two of the most popular (and expensive) themes on the market right now, Gravity Forms is going to have a long way to go convincing people that a plugin’s developer license should cost more than the developer license for their premium theme. Given my obvious misgivings about Gravity Forms’ prices, would I still recommend the plugin? Most people are never going to need a developer’s license. And, at $39, the plugin doesn’t need to save you much time at all before it’s well worth the small investment. Have you used Gravity Forms? What did/do you think of it? What kinds of interesting applications have you found for the functionality offers? Or, do you know of other plugins (premium or free) that you like better? Thanks for the review! We are glad that you enjoy the plugin and understand the possible issues some may have with the pricing structure. We put a lot of thought into the pricing structure. One of the things we considered is the competition. This may surprise some of you, but we don’t consider cforms or Contact Form 7 to be our competition. Our competition is Wufoo, FormSpring, Icebrrg and MachForms among others. Each of these is a paid product, most are hosted so you don’t even get the code. Wufoo, FormSpring and Icebrrg have a monthly subscription fee attached to them and you never own the product. MachForms is a PHP application that you download. 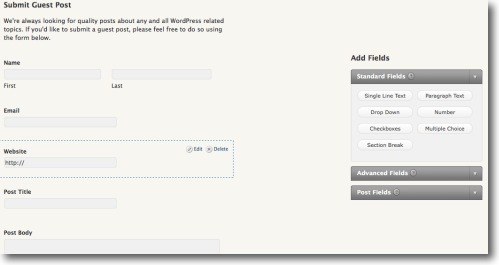 Not only does our pricing compare favorably with our competition, we offer something they don’t… WordPress integration. Thanks again for the review, we are just getting started and have many more features we plan on incorporating into Gravity Forms in the future. It’s only going to get better! Carl, thanks for stopping in! I LOVE the additions you made in version 1.1 and can’t wait for the other things you’ve got in store. I can definitely see why you don’t consider most of the form plugins out there to be your competitors but in the WordPress environment, you guys are at the high end of the scale for sure. Like I said, I’ll probably end up upgrading to the developer license at some point, but I think you’ll definitely be combating sticker shock among most prospects. In the end though, I think my title sums it up well. Expensive (for a WordPress product) but worth it. Thanks for your review, Ben! I would be interested in how it compares with cforms, which I have had someone rave about. That being said, I am not a “nobody should ever charge money for something” kinda guy! The ability to submit guest posts automatically, with admin moderation–now that’s brilliant. That’s actually a game-changer, thinking outside the box. Now, I think that’s a type of area where a premium plugin developer would want to think — along with having to make things really nice and friendly — they would really want to think of ways, like this feature, that make the plugin special. That feature could streamline the process of getting guest content. The reason I took a look at Gravity Forms is that all submissions get stored in the db and are easily viewed in the admin. For those of us with a ton of email we’re already trying to corral, this feature makes keeping track of submissions a ton easier. I pass the cost of such software on to my clients. This is functionality worth paying for. I haven’t tried gravity forms but looks very good. FYI – another plugin that does the same functionality as your “guest post” forms is TDO Mini Forms – which is free. Michael, if all I was using Gravity Forms for was the guest post functionality, I might consider moving back to a free plugin. However, Gravity Forms provides a TON of other functionality. Things like a tie into Mail Chimp to manage email contacts, being able to use it to create user generated content sites, contact forms of course, that all makes Gravity Forms a great purchase IMO. I know I certainly haven’t regretted it at all. Thanks for the update on this post Ben. The dev license has been very well worth it and Gravity Forms is now installed on all my WP projects. The guys at rocketgenius have lifted the bar on both features/functionality, and support of premium WP plugins. Hopefully this becomes the trend rather than an anomaly. thanks for the review. i’ll try it out and let you know how my form experience goes… the plugin looks very promising. I’m grandfathered in to a lower aweber package & would pay much more to transfer to MailChimp. PLUS, I’d have to ask all subscribers to *re-optin through MailChimp if I left aweber. 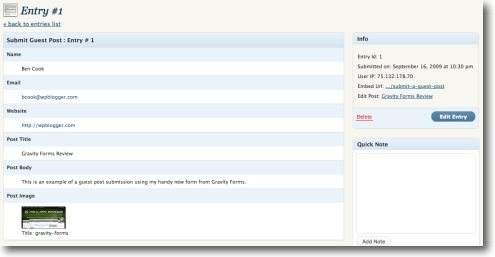 Do you know if gravity forms allows the data to be automatically posted to a separate page that is updated by date and time every instant a user completes the form? Like others above, I’m still wavering on this purchase. And yes, the hesitation is on price. For me, the paypal integration is one of the must have elements which unfortunately demands the heftily priced developer’s version. I want it, but … but … but.